James (J.W.) Woods, 93, of Higbee, Missouri, died February 5th, 2019, surrounded by his children at the Harry S Truman Memorial Veterans Hospital in Columbia, Missouri. James Wesley Woods was born June 26, 1925 in Oklahoma. He was the oldest child born to Homer and Eula Hayes Woods. J.W. married Louise Garrison on February 26, 1944. Jim served his country honorably during World War II. He was awarded the ATO Ribbon, Good Conduct Medal and the Victory Medal. He worked various jobs throughout his life supporting his family, including logger, construction worker and truck driver. For the last 19 years, he was employed at Wal-Mart of Moberly prior to his retirement in 2018. 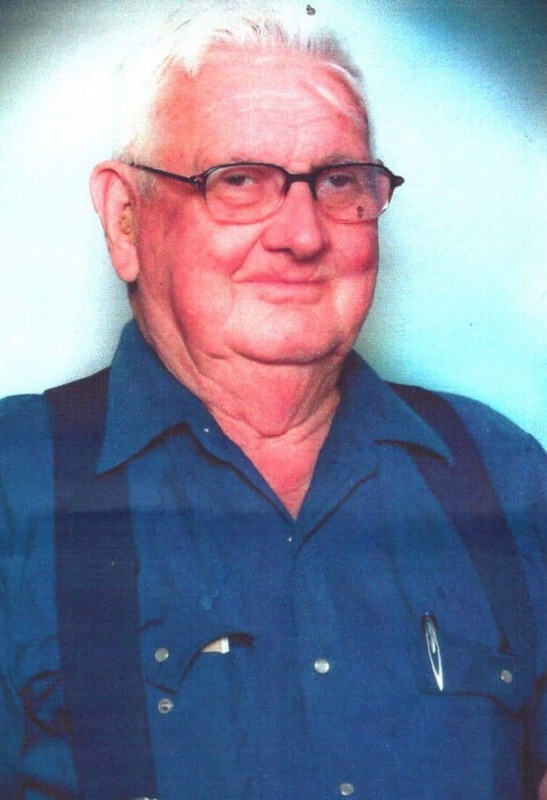 He is survived by two daughters, Linda (Wyatt) Wilson and Barbara (Tom) Duvall, all of Higbee; two sons, Jimmie (Candy) Woods of Armstrong, MO and Clint (Carol) Woods, Sr. of Higbee; in addition to numerous grandchildren, great-grandchildren, great-great-grandchildren, and nieces and nephews. He is also survived by three sisters, Evelyn Boggs of Higbee, Ruth Thompson of Armstrong, MO, and Thelma Washburn of Higbee. Jim is preceded in death by his wife of 66 years, Louise Woods, infant son James Jr., daughter Katherine Riggs, son-in-law Robert Riggs, grandsons Bobby Riggs and Clinton “Pee Wee” Woods Jr., daughter-in-law Victoria Woods, as well as two sisters and two brothers. A service celebrating his life will take place February 16, 2019 at the Higbee Lions Club in Higbee, Missouri at 2:00 pm. All family and friends are invited. The family gratefully acknowledges the outstanding care Jim received at the Harry S. Truman Memorial VA Hospital in Columbia. In his honor, please consider making a donation to the VA Hospital so that they can continue serving our Veterans. Checks can be made payable to “Truman VAMC” and mailed to HST Memorial VA Hospital, Attn: Voluntary Services, 800 Hospital Dr., Columbia, MO 65201.